RP38450 is rated 4.7 out of 5 by 7. Rated 5 out of 5 by Vell from great I brought this a month ago and I am so happy I did, could not find the right size at any store I went to, I love the two tone that way I can match the gold that was already in my bathroom. I love it. Rated 5 out of 5 by louie from perfect! so happy with this purchase…the gentleman that helped me was terrific! Rated 5 out of 5 by Ronbo from Looks great, and at a great price. This faucet was just what I was looking for to match my two-tone bathroom hardware. Fast service, and easy to install. Rated 5 out of 5 by liljem from Easy to install This was a home project and it was simple to install. The purchase was quick and I received the product within a week. I live in Hawaii......I highly recommend it. 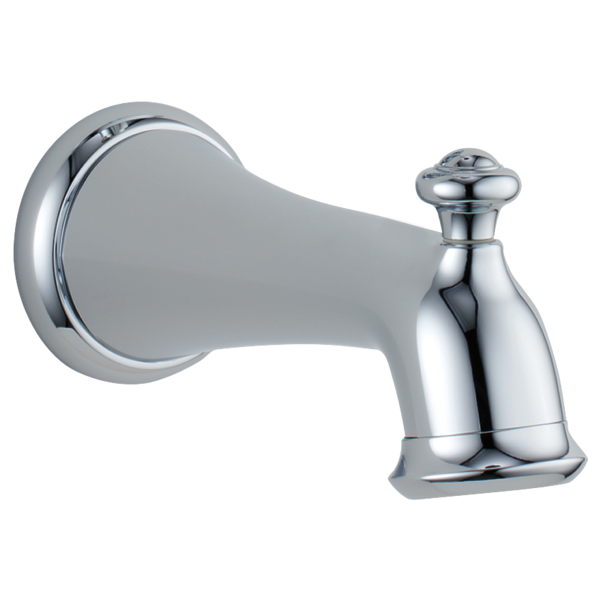 Rated 3 out of 5 by husker from a spout with much doubt We had this new shower& tub faucet installed professonally about 2 years ago. It has been operating satisfactory although the kids thought that it work wierd. Turnig the water on it would first come on part force then cointinuing to turn the faucet it would go off then come back on again. But they learn how to deal with it. I came home last week and the spout on the tub had been broken. It is made entirely out of plastic, so all of the replacement parts at the local Lowes ot Home Depot do not work. I do not mind ordering a part from the company, but plastic. Of coure no one knows how it was broken, but all four mounting studds were broken. How far in is the set screw located for slip connection?